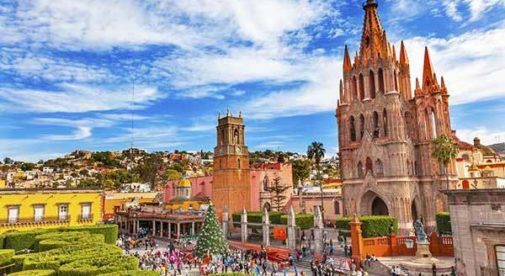 Although it’s grown into a small city of about 70,000, the colonial gem of San Miguel de Allende retains its charms. It can feel like a small town when you frequent the same little grocer, corner store, and carnitas (roast pork) vendor in your colonia (neighborhood). I always see friends when I’m out and about; we stop for a chat to catch up and make plans for the weekend. Thanks to its UNESCO World Heritage protected status, all historic structures in the Centro (roughly 30 blocks) must be preserved; even minor renovations are subject to a strict approvals process. One of my favorite things to do is just take long walks around the colonial district. I always find something new. A bakery with delectable French pastries. An artisan shop selling the perfect margarita glasses for our next party. Or an outdoor restaurant in a courtyard with the best Mexican breakfast (at least in my opinion): chilaquiles (tortilla chips with red or green sauce, cheese, and eggs or chicken). But you don’t have to live in Centro to enjoy San Miguel. In fact, with the grand restored homes and its desirable location, many of homes in this neighborhood are quite pricey these days. Besides, with the many festivals and celebrations, often with nighttime fireworks and clanging church bells, being in Centro can be noisy. Better to enjoy the festivities you want and then be able to go back to your quieter colonia. The better alternative is to look just outside Centro, to peripheral neighborhoods that are within an easy walk of all the action. But far enough away that housing prices are cheaper and there’s less congestion on the weekends. The central park is known as the “Jardin.” Just southwest of here you’ll find Colonia San Antonio. Older expats enjoy it because in a town of steep hills, it’s mostly flat. It also offers easy access to a main thoroughfare, the Ancha de San Antonio, where you can find little taco restaurants for a quick and cheap meal, gourmet markets for those ingredients you can’t find elsewhere, the Saturday organic market, and more. Very self-contained. A newly remodeled two-bedroom home is available for $299,000. There are floor-to-ceiling windows in the main living room with panoramic views. And you can see the whole city from the covered rooftop terrace. With mild weather, terraces are where people host parties, enjoy a sunset glass of wine, or morning coffee year-round. Independencia is an outlying colonia, a bit more of a trek to Centro but doable; many people walk in and then taxi back. It’s mostly home to hard-working locals with a smattering of mix of expats in seek of good-value real estate. It’s primarily residential, with plenty of little stores to get anything you need and simple restaurants offering up tacos and similar fare. It’s quiet. On sale now is a two-bedroom home with a high-walled private courtyard, a fountain and small garden, and a large rooftop terrace with views of the town. It’s available for $215,000. North of Centro, Colonia Guadalupe is a mix of restored colonial-style homes and those in need of some touching up. You’ll find plenty of art and artisan galleries on the main strip. A “can’t miss” is Fabrica La Aurora, a vast former textile factory now filled with cafés, restaurants, and dozens of small galleries. Abundant street art murals continue the area’s artistic theme. A two-bedroom condo in a gated community with tennis court and pool is available for $310,000 and comes fully furnished. Half of the unit can be “locked off” and rented separately as a studio apartment for extra income.